For decades, jazz musicians have been utilizing harmonies and sounds from the major, harmonic minor, and melodic minor scales, as well as symmetrical scales like whole tone, diminished, and augmented. Another scale, named by Rimsky-Korsakov in 1885, hasn’t been implemented nearly as much: the harmonic major scale. In recent years, some innovative jazz musicians have begun to explore this scale’s harmonies in depth, but plenty of unexplored ground with unique and beautiful sonic possibilities still exists. This class is intended for intermediate to advanced level jazz guitarists who already have a strong grasp of the traditional jazz guitar vocabulary and who are interested in injecting some new life and fresh, modern sounds into their playing. This class first explores the basic structure of the harmonic major scale, as well as the harmonies generated by the scale. Next, a clear and systematic way to map out the scale’s location on the guitar fingerboard is presented, along with many different exercises and patterns to help the student develop melodic flexibility with the scale. The class also explores, in depth, the diatonic harmonic major triads and seventh chords, including the drop 2 and drop 3 chord scale exercise similar to that used in the Jazz Guitar Harmony series but applied to the harmonic major scale. Then, a complete guide is presented for using all seven modes of the scale in improvised situations, both harmonic (comping) and melodic (soloing), with examples for each sound. Finally, two etudes, one harmonic and one melodic, are demonstrated and analyzed using the chord changes from the popular standard “Stella By Starlight” in order to give a concrete example of how the sounds from this structure can be used by the jazz guitarist. This class provides a logical, systematic step-by-step approach for developing fluency with the harmonic major scale and attaining mastery of its melodic and harmonic possibilities. All musical examples from the video are provided in music notation, tablature, and chord grid form. Each example performance in the video is titled and numbered for easy navigation. I purchased Tom’s harmonic major lesson a couple of months ago and am still going through it now trying to commit the chords and patterns to memory. His lessons are well thought out and rich in content, I will be purchasing more in the future. Thanks Tom! If you want to incorporate this modern sounding scale into your playing get this class. Tom Lippincott explains everything you need to know to practice and assimilate both the harmonic and the melodic aspects of what this scale has to offer, and he does it in a very thorough manner, easy to understand wether you’re an advanced player with a good grasp of jazz theory or a beginner. Awesome class! Very good material, very useful for a different point of view,always interesting from Mr Lippincott. If someone wants to improve the guitar ideas, this is a good way to do it. Very easy to understand and to follow. Thanks Tom for your work. 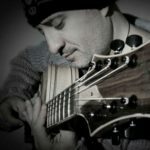 During a very pleasant conversation with Jonathan Kreisberg a few years back, Jonathan expressed the importance of learning about the Harmonic Major Scale.This lesson by Tom Lippincott is the most detailed explanation and demonstration of the scale and its harmony, for guitar i can find on the net. This lesson is excellent. I wasn’t familiar with the harmonic major scale until I found Tom’s lesson on it. It is full of great ideas that sound very modern. Tom has a lot of clearly presented ideas to get you started and there is lots more information and study material the keep you going. Recommended! A great sound explained clearly. It is already expanding my playing after a few weeks of getting familiar with it. Excellent course!Tom is a expert guitarist and instructor. Tom Lippincott’s classes have NEVER been anything less than incredible. This one is no exception. These are some of the most unusual sounds used in modern jazz, but Tom’s progression of steps makes it accessible. The written examples alone are worth the purchase price; complete, clear, and well-explained in the video lesson. Not easy material, but for an advanced musician looking to get the sounds of the future now, you can’t beat this one. The Harmonic Major Class is very detailed and comprehensive, I have learned a lot from it. Tom Lippincott really knows his stuff and his explanation of the material is very thorough and leaves no questions. It is definitely worth every penny. If you are unfamiliar with Tom Lippincott’s Masterclasses, they are an amazing and rare opportunity to study music with a virtuosic and well informed jazz guitarist. Tom’s classes are always extremely well organized and provide great insight to each topic. Tom’s class on Harmonic Major is fantastic and to study this material with a modern master will open your playing regardless of what instrument you play.